THIS IS A SCHEDULED POST. I AM OFFLINE UNTIL SATURDAY 30TH APRIL AND THEREFORE WILL BE INACTIVE. Hi everyone! I’m back with another (AMAZING) tag, which I was asked to do by the lovely Emma! Broken things are beautiful, too. Only for part of the book, but I think this is kind of appropriate! Specifically Baz to Simon at the start of this amazing book! Jaycee comes across as so fragile, I thought this song would be perfect for her. She needs to be told that nightmares only last for a night, too. I think this pretty much applies to any long distance relationship, though. I really enjoyed doing this tag! I expected to find it a lot harder than it was, and it didn’t take me long to get 5. 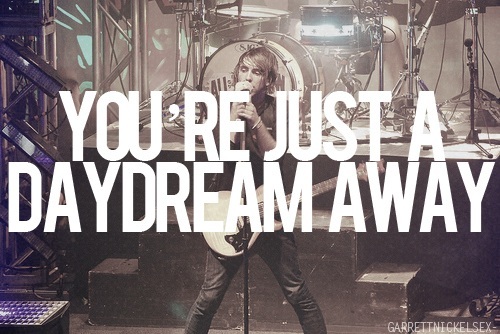 I love All Time Low soooo much!! Great choice 😀 And ahh thank you so much for the tag! Music is my favourite thing in the world so this is going to be a lot of fun!! !